Enhance your Indian or Moroccan themed event with the rich tones of blue and gold. These stunning votive candles will create a mesmerizing glowing atmosphere of firelight on your tables. 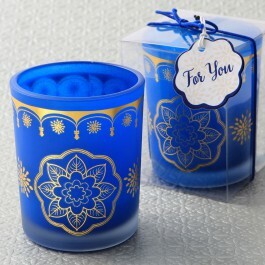 The votives are made from blue frosted glass and printed with an intricate gold Indian / Moroccan themed design. The votive comes with a white tealight candle. This sensational tealight holder is packaged in a clear gift box. The box is wrapped with a blue cord and a bow. Attached to the bow is a 'For You' tag. The perfect favor to enhance a rich, exotic Indian or Moroccan decor themed event! Size 2 1/2" x 2" Made from blue frosted glass Printed gold Indian / Moroccan design White tealight candle included The perfect favor to enhance a rich, exotic Indian or Moroccan decor themed event!